The Philippines battles with high levels of poverty and inequality. The proportion of households living below the official poverty line has declined very slowly and unevenly in the past four decades, and poverty reduction has been much slower than in neighboring countries. High levels of population growth and exposure to environmental disasters are factors that contribute to continued poverty. These forces have shaped patterns of migration and displacement in the Philippines. In 2009 nearly 10% of the citizens were living outside the Philippines. This overseas workforce has created a powerful flow of remittances into the Philippines which now accounts for over 11% of GDP. With increasing exposure to disasters at home, this flow of remittances from abroad has provided some financial stability for families affected by disasters. Internal displacement remains a key problem. This displacement has a number of causes including conflict and development projects. Three million people were internally displaced between 2000 – 2009 due to conflict and human rights abuses. But disasters are now the most significant factor driving internal displacement. The Philippines is especially vulnerable to natural hazards such as tropical cyclones (especially in the northern and eastern parts of the country), floods (central Luzon and Southern Mindanao), landslides (due to the terrain of the country), and droughts. Since the 1980s these hazards have become more devastating as cyclones and rainfall have intensified despite the number of rainy days and total annual rainfall decreasing. Over recent years, the population have experienced severe floods, landslides, drought and forest fires. This is having a devastating effect on agriculture, fresh water, coastal and marine resources, health and livelihoods for the poorest communities. These disasters have also created widespread displacement. The vast majority of this movement has been internal, rather than cross border. The connection between tropical storms and climate change remains complex and to some extent unclear. Determining the extent to which climate change has played a role in recent displacements in the Philippines is therefore difficult. Evidence does indicate that number of severe tropical cyclones is higher in warmer years. Future hurricanes may “upstage” recent storms as higher global temperatures lead to more powerful storms. Sea surface temperature is one of the key factors effecting hurricane formation and warmer seas may provide more energy for hurricanes when they form. However there are other major factors currently influencing the frequency and intensity of hurricanes that may not be linked to climate change. Modelling suggests that globally the number of hurricanes may decrease or remain the same, but the intensity and the number of severe storms may increase. However predicting changes to hurricane activity in individual ocean basins is still difficult and uncertain. Regardless of the connection to climate change, for many hundreds of thousands of people, displacement due to disasters has become a reality. 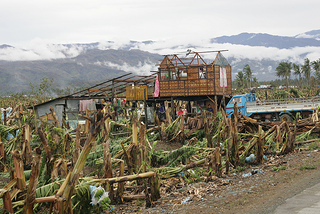 Tropical storm Washi, known in the Philippines as Sendong, hit the coast on 16 December 2011. It killed more than 1,500 people, damaged over 50,000 homes and displaced some 430,900 people. The greatest impact was felt in and around the cities of Cagayan de Oro where over half the population (461,877) was displaced and Iligan where approximately one third of the population (285,061) was displaced. Just a year later another devastating storm hit the Phillipines. Cyclone Bopha killed several hundred people, displaced in the region of 200,000 and destroyed some 28,000 homes.